Personally, I am (partially) moving away from drip irrigation to sprinklers this season. Thing is, the drip tape is a chore to install, and gets in the way of weeding. So, for crop that require irrigation very infrequently (such as most roots, cabbage, storage onions, garlic, winter squash, etc), I will forego installing drip tape entirely and rely on sprinklers instead. Crop that require frequent irrigation (all greens, radish, and such) will be in a different section of the field where I will run my drip tape setup. 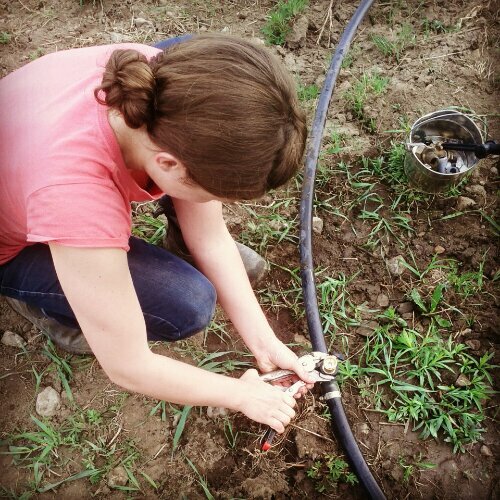 Dubois has a good drip irrigation start-up kit (I think that’s what Dam resell). I bought mine three seasons ago, and still use it (I had to change the manometer for about 20$, that’s all). Drip tape are around 250$ for 10,000′. Beside Dubois, I also order from Irrigation Direct at time. Also, I found out that 1.5″ lay-flat header pipe actually come out cheaper than 1″ black carlon. It’s not as durable, but apparently it can last 7-8 seasons if you take it inside at the end of the season. I have done some pretty heavy irrigation for my scale, using soaker hoses and sprinklers, the latter often used in later evening when any wind has died down and the water has the night to hang around. I have sprinkler stands that telescope up to about 5′ so they’d throw over taller crops like brassicas, and I did 50’x50′ sections at a time with one at each corner, and a bunch of mini rain gauges set at different spots where the arcs did and didn’t overlap. Quick and kinda fun – I’d drop 1/2″ or 1″ at a time and good for a week or until next rain. Lotta dragging hoses around, but with two people and a nice set up of quick connects and hose lengths, it’s just…movement. My longest dry spell was around 10-12 weeks with zero rain and heat wave conditions for much of it. I lost a ton of seedings that didn’t germinate, but really not that much work, only walking up and down the rows with the seeder, and the lost seed, the bed prep was already done. So, re-rake and go again. I wasn’t short for CSA shares, had a lot of stuff at the market, overall, it had surprisingly minimal impact on overall production, just lots of extra hose work. So you get better yield with regular irrigation, things grow a bit bigger, one mid-size farm I know about turns on drip daily, even if it’s raining. I kinda like veggies that have done well through the weather they got, plus a little emergency watering to help em along when needed. Not so…scientific, but satisfying and I haven’t really lost that I noticed. Yeah irrigation… phew what a can of worms. Here (Australia) it’s seen as essential in most areas because drought is so frequent, but sometimes it seems like a lot of the old timers can do without because they know the weather patterns. Though those are changing in a lot of places. One guy I know swears that his vegies taste better because they’re grown without irrigation. And they were good! I’m also interested in the drip tape/hoeing dilemna. Putting it subsurface solves the problem but is a lot of work. The stronger drip line is easier to move off and on but expensive. Maybe sprinklers aren’t as evil as people make out? Which type of sprinkler heads do people prefer? Hope that’s useful! :) Great blog, btw, keep it up! Way cool to use a hybrid irrigation system! And we totally feel your pain about changing up irrigation during the summer time, not to mention the weeds (eeps!). These days we’re using our water harvesting barrels since the monsoon has rolled in. Have you tried it? Just attach a hose and hand water as needed. Thanks for such useful post! This info is very valuable.